Founded by pediatrician Dr. Zak Zarbock, Zarbee’s Naturals™ went to market in 2008 with a safe, drug-free, vitamin-enhanced cough syrup for children that’s based on the effectiveness of dark honey for calming coughs and soothing irritated throats. That success has led to other products, including its new line of Honey Cough Soothers, a premium product that’s redefined the cough drop category. 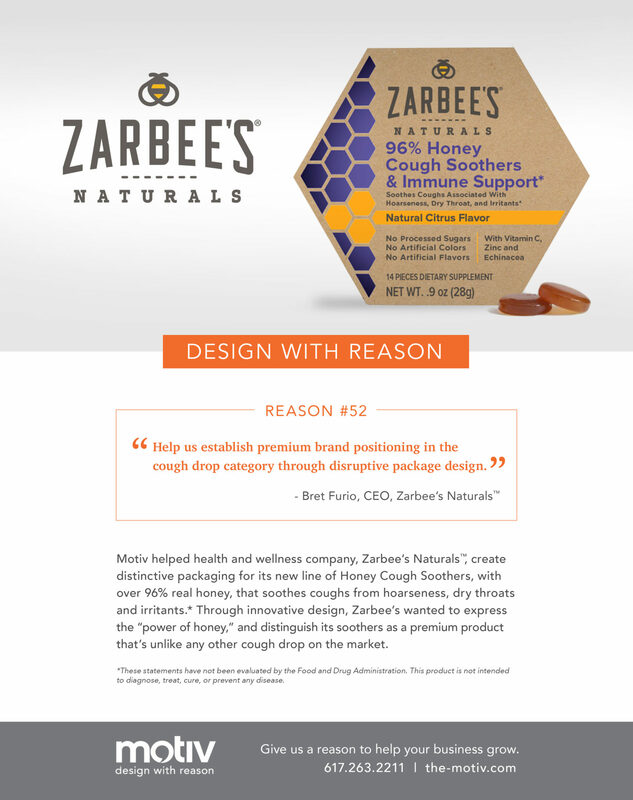 Motiv helped Zarbee’s to disrupt the market with innovative package design to connect the product with the power of Zarbee’s Naturals™ wholesome ingredients, consisting of 96% real honey.